Last month we reported how Rogers had sent out a message to all of its employees asking them to email their local MP and Prime Minister Harper to share concerns over the current state of wireless auction policies. Obvious throwaway here, and I know this was posted before, but I’m posting this from another carrier. I work for Bell Mobility, and I feel the daily pressure from management and our executive office to send the pre-written email to complain about Verizon coming it. If I remember correctly they are calling it “close the loop”. Every day, I get an email reminding us that the government is treating Canadians unfairly by allowing Verizon to come in. They are sending our stats saying “So far, 22,000 employees have sent the form, that’s over 4000 employees in the last day!”. Then we get emails from our direct managers and directors reminding us of the importance of sending this letter, and reminding us to read the open letter from George Cope about the issue. I don’t know if this is illegal, because it’s not like they are making it a job requirement, however I definitely feel the pressure. For the record, I haven’t signed. I’m not going to either. I’m a consumer just like you. My integrity comes first. I get the same sh*t from TELUS. I work there. I’m all for Verizon coming in, ESPECIALLY since they just jacked up the plans by a factor of 2-3 to accommodate the new 2 year models. Interestingly, moving to a two year model should only cost a subscriber $7-$10 more a month, yet their 1 gig plan went from $55 to $85. 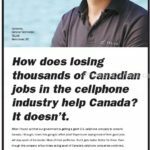 I work for Rogers and we get the same sh*t.
Just yesterday Industry Minister James Moore criticized the Big Three telcos for “dishonest” lobbying aimed at skewing the public debate. 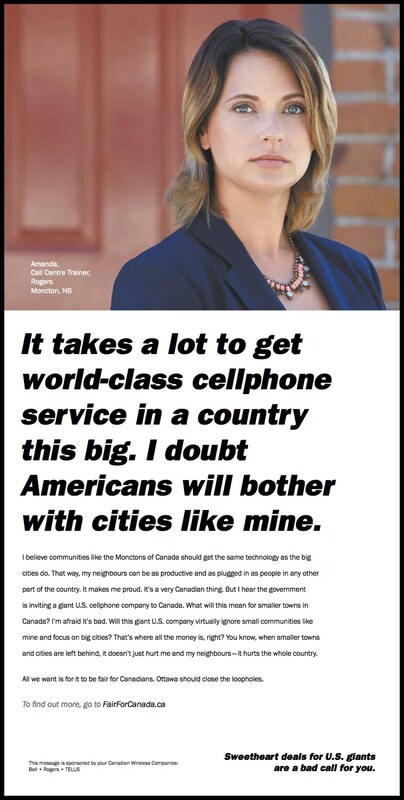 Despite the constant noise of incumbents, Ottawa and Prime Minister Harper have publicly reiterated they will stand their ground and not change policies to prevent Verizon Wireless from entering Canada. Any Big Three employees out there feeling this internal pressure to email Ottawa like what we’ve read on Reddit?